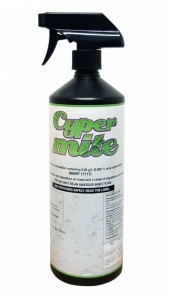 Cyper Mite is a ready to use spray suitable for a broad spectrum of pests. Extremely fast acting, Cyper Mite is a systemic insecticide that penetrates the plant giving results quickly. Suitable for a wide range of plants including fruit and vegetables. Will eradicate a number of different pests including: SpiderMite, Aphids, caterpillars and beetle infestations. Cyper Mite can also be used as a preventative treatment.